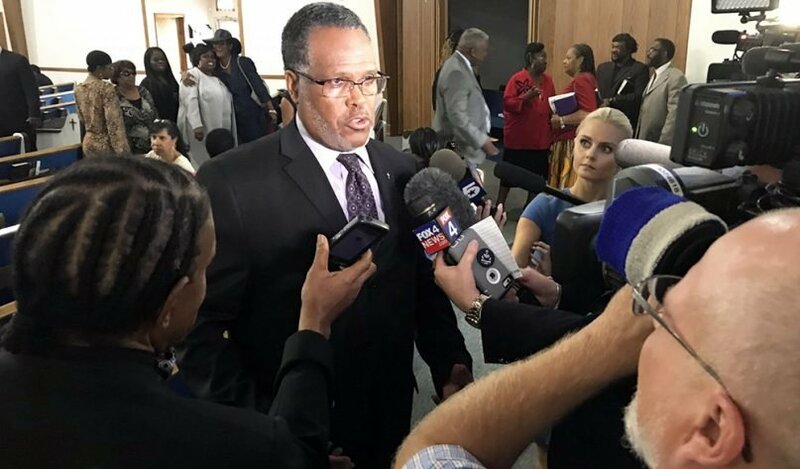 Minister and elder Sammie L. Berry talks with the news media after a Sept. 9, 2018, worship assembly at the Dallas West Church of Christ, Botham Jean’s home congregation. RNS photo by Bobby Ross Jr. The preacher stood wearily on stage, wiping tears from his eyes. The mayor, working to bring healing to a city of 1.3 million, sought solace on a front pew. “I know that Jesus — Jesus— he will fix it after a while,” the church sang. 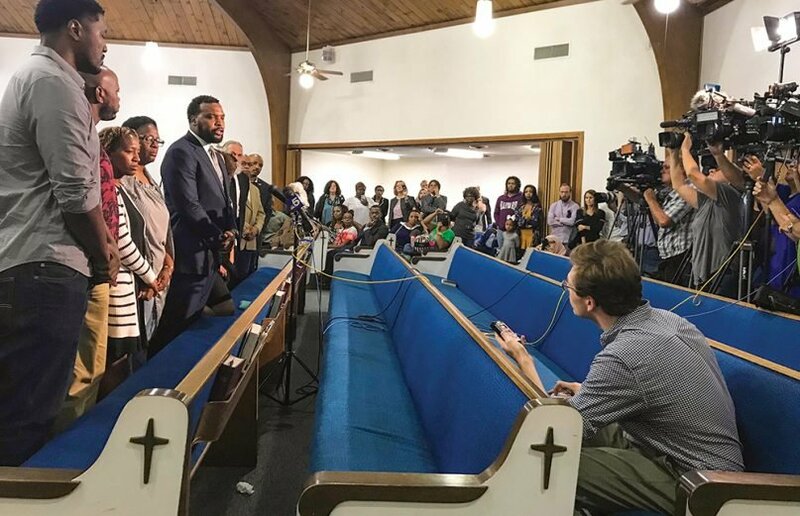 Television and newspaper cameras captured the emotion — and the heartbreak — as the Dallas West Church of Christ gathered to worship just days after the inexplicable killing of 26-year-old Botham Jean in his own apartment. The recent Sunday was no ordinary Lord’s Day for the congregation, which was grieving the sudden loss of a beloved song leader and Bible class teacher — and doing so under an immense media spotlight stretching from Texas all the way to the Caribbean island nation of St. Lucia. Attorney Lee Merritt, left, with Botham Jean’s mother, Allison Jean, to his right, speaks to the news media at the Dallas West Church of Christ after a prayer vigil on Sept. 8, 2018. RNS photo by Bobby Ross Jr.
“Somebody like Bo — why?” church member Sherron Rodgers said, uttering the question on everybody’s mind. “Why did it happen to somebody like him? I’m just sad. According to those who knew him, Botham Jean was a devoted man of faith with a “beautiful” and “powerful” singing voice. He was baptized at age 10 in his native St. Lucia and moved to the U.S. at age 19 to attend Harding University, a Christian liberal arts university in Searcy, Ark. He often led worship at Harding’s daily chapel assembly and served for three years as a ministry intern with the nearby College Church of Christ. 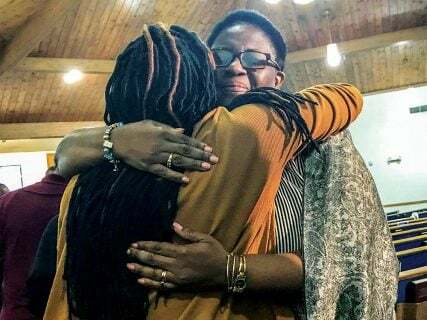 Allison Jean, right, mother of shooting victim Botham Jean, hugs a mourner after a prayer vigil Sept. 8, 2018, at the Dallas West Church of Christ. RNS photo by Bobby Ross Jr. Officer Amber Guyger, who lived in the same apartment complex as Botham Jean, was charged Sept. 9 with manslaughter and booked into jail before posting bond. According to an arrest affidavit filed by Texas Ranger peace officer David L. Armstrong, Guyger worked her shift Sept. 6 and then returned home. At the apartment complex’s multi-level garage, she parked on the wrong floor and then mistook Botham Jean’s home for her own. After entering through his slightly ajar door, she confused him with a burglar and opened fire. But for the victim’s mother, a former top government official in St. Lucia, many perplexing questions remain. The official narrative about how her son died doesn’t make sense. Botham Jean’s death has refocused national attention — and even international attention, given the St. Lucia connection — on police shootings of unarmed black males by white police officers. “We demand full transparency, consistency, and integrity in the days ahead as the judicial process progresses,” they wrote. A criminal investigation is ongoing. So far, Guyger has not faced disciplinary action from the Dallas Police Department for the shooting. “An exhaustive and thorough criminal investigation is essential, and as soon as we are assured that conducting an administrative investigation will not impede on the criminal investigation, we will proceed,” Dallas Police Chief U. Reneé Hall said in a statement this week. At the Dallas West Church of Christ, minister Sammie L. Berry said the congregation will work to support the family and make sure justice is served. “Bo was an outstanding young man,” Berry said of Botham Jean, who had started preaching occasionally on Sunday nights. “You just can’t think of how this could happen to him. I mean, all he did was go to work, go to church, help people. “We’re going to make sure that his name is lifted up. We’re going to make sure that we get answers to what happened,” the minister added. “We won’t allow this to be just brushed to the side and move on to the next case. He meant too much to his family. 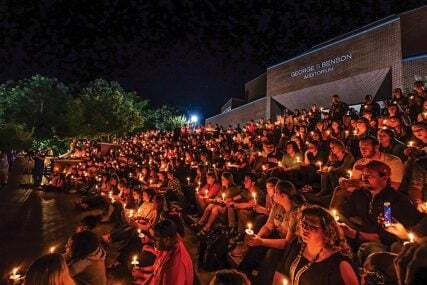 He meant too much to this congregation, to his college, to the place where he worked.”Allison Jean told the congregation at a prayer vigil that her middle son “did everything with a passion,” including serving the Lord. 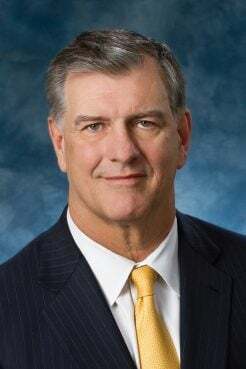 Dallas Mayor Mike Rawlings, who earlier met with Botham Jean’s family to express his condolences, stayed for the entire two-hour Sunday service. At the end of the service, Rawlings told the congregation he came not in an official capacity but as a citizen, “wanting to soothe some of my hurt because the city of Dallas is hurting so bad. “To be able to sing with you, to be able to pray with you, to be able to listen to this wonderful sermon was just what I needed because I feel like, as mayor, I’m in the perfect storm,” he said. Tommy Bush, a retired executive minister, works with a small congregation in Romance, Ark., an unincorporated community about 20 miles west of Searcy. Bush, 70, served as a professional mentor to Botham Jean his senior year in college and helped the accounting graduate land a job with PwC, formerly known as PricewaterhouseCoopers, in Dallas. The two became close friends and worked together to support missions in St. Lucia and Kenya. Bush said he prays the charged officer knows Jesus.